NEW COLOR PALETTE FOR THE FAMILY ROOM! These darling blue and white chairs are the inspiration for changes coming to StoneGable! I could almost live at my local Pottery Barn outlet. It’s exactly 4.7 miles from my home. Dangerously close actually. This is a place where everybody knows my name. Just like “Norm” if you are old enough to remember! I was there this past weekend and even before I got inside I spied these chairs through the window. Yup! I literally said out loud, “I LOVE those chairs”!!!! I really was not ready to push the blue button just yet, but the chairs forced my hand! Especially since they were 40% off the outlet price. I do love a fabulous bargain. But not just because of that… but because these were the right chairs! So they came home to live at StoneGable. And I am thrilled. They take me a step away from the upscale farmhouse look I’ve been curating for about 6 years. I still like a touch of farmhouse in my inspired farmhouse home but I’m going back to my classic American styling roots. I love these chairs modern low profile and comfy lumbar cushioning. But the fabric is my very favorite! This almost navy and creamy white works so well with the whites and caramel neutrals that are the workhorses of my family room color palette! Much of my furnishings in the family room will stay with just a couple of changes. As you can see I’m not giving up my neutrals but adding a little blue richness! But just a little! The walls will still be Benjamin Moore Sonnet and trim Atrium White. And I am looking for crisp white cotton drapes that hang from the rods I already have in my family room. I’m still looking for a side table and a few accents. I would not call this a makeover because I’m mostly using what I have. So let’s call this “freshen up”. As the room gets pulled together I’ll share its progress! Yvonne, your edited and updated rooms really do look fresh and calm! I have to say though, that I LOVED the black striped rug in the breakfast nook!! Two questions: I am in love with your new breakfast table chairs. Would you share where you got them, etc? Also the gorgeous fabric on the white settee with a throw is to die for! Is that in your home, or just an example? Shopping information? Hi Susan, the chairs in the breakfast nook came from Birch Lane. You can find the breakfast nook chairs HERE:https://rstyle.me/n/dexi5bb6by7. As far as the settee, are you talking about the one in my bedroom? If so, I found this on Soft Surroundings but they do not have it anymore. I’ve looked EVERYWHERE for this fabric to make pillows but cannot find it. I think it is Italian made. Sorry I can’t help you more than that. Love your new cobalt chairs. Would love them even more if they came in black. Beautiful pattern! I just did a blue purge including tableware. Love your classy farmhouse style. 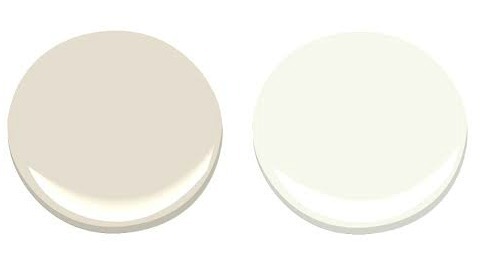 I will be painting using either the Sonnet color or Edgecomb Gray.. plan on doing a glossy black ceiling in the foyer for a little drama. Other furnishings will be neutrals with chartreuse green being the accent color. You have a beautiful home! Kathryn, this sounds scrumptious! You are a brave one! So glad you are adding color! I am so tired of burlap and all neutrals…I love your blog, and have for years…just ready for a fresh look with some color. You will do it well my friend! Oh, I’m still in love with neutrals and burlap. I don’t think that will change! But I do love a little color here and there. So nice to hear you have been reading StoneGable for a long time. Hugs to you from StoneGable, my friend! On a recent podcast you spoke of a chair you bought online for about $200 that you love that never made it upstairs. Mentioned a link in the show notes, but could not find one. Any information on that would be appreciated. Praying for you and your foot issues. Right now Wayfair doesn’t have the Callaway Mineral color. They keep selling out of it. But they keep restocking it. How many StoneGable readers do you think have it in their home? Yvonne, I love the addition of the blue print chairs. I absolutely love your style & home! My living room consistists of warm neutral colors & I would love to add accent chairs with a bit of color in the future. You mentioned in your post that your looking for crisp white curtain panels to add to the room. I really struggle with curtains. My furniture is neutral, and my walls a neutral beige with yellow/golden undertones. I’ve always put up curtains with a solid golden tone & never considered crisp white panels because I thought they would wash out the room. I struggle with window treatments & would love your advice. Should I go with white window treatments as well? Do you recommend sheer or solid? Hi Robin, I love white so white curtains are something I’m going to try. It’s hard for me to give you advice because I can’t see your whole room. White goes with everything and really freshens up a room! I love, love, love those chairs! That print is so wonderful and I love the wooden legs that go with your wood floors in that room. Not only are they beautiful but they look so comfortable. What a find! I love your touches of blue with the neutrals. Blue has always been one of my favorites and I love what you are doing with it. It would definitely be dangerous for me to live so close to a Pottery Barn Outlet. There are none near me unfortunately. The room looks beautiful. I LOVE YOUR NEW CHOICES, HOWEVER, I ALSO LOVE WHAT YOU HAVE ALREADY SELECTED AS WELL. YOUR DESIGNS, ‘DO ME WELL’. First of all hoping your foot surgery is soon behind you and you have a great recovery! I am in awe of your decorating and often wonder “oh my goodness where does she store things?”. You have never had anything less than excellent taste in my opinion so adding or subtracting just always keeps things interesting. We are building a home and after downsizing all that I had, much that I hope blessed others as we put it out by the road :), I am being super cautious about buying much right now until I move in and really picture where it is. Our TV will be to the left of the fireplace and we will have a bookshelf on the right, so it was fun to see your setup and know it will look nice! Running a website such as your has to be super hard and take a lot of time. Thanks for sharing your gifts with others. Keep up the great work! Thanks, Cindy and congratulations on your new home! May you be blessed in it! I love all the different chairs you have…..how do you feel about buying furniture o line….I won’t put you on the spot about the three big online stores. I have one picked out to order but scared to Big that button….what do you think. I bought a desk online which turned out great and also a ottoman but always wondered how safe it was to buy actual chairs. I was thinking if I went and sat in them I could order them online if they are out of stock by the time I was ready to buy. I purchased our last sofa at a store after sending my husband a picture and he dislikes the sofa due to not “feeling comfortable”. Note to self: I will bring him the next time I buy a chair for him or another sofa. 🙂 Good luck, I see so many pretty chairs online it is easy to see why people buy online. Love your style!! Curious to know if you are keeping the gorgeous chair with the large houndstooth check. Love that chair!!! Love love love those blue chairs! Love , Love your blue paisley chairs. You made the right decision to purchase those beauties. I can not wait to see your completed room. Where are the other two chairs from? I have been on the hunt for reasonably priced chairs for a while. I have two wing backs I wanted to recover but the cost may not be worth it. Not including fabric I am at $750!! I love these chairs to. The color is beautiful also. Truthfully, no matter what idea/design you come up with, it’s always fabulous, clean, and out of this world gorgeous. Please come to our home, and help us get a home like yours. Love it! Thanks for the inspiration. You are so lucky to live by a pottery barn outlet. I love your new chairs, they look great in your room. Would like to know why my comments are not posted? Thank you in advance ? Hi Linda, I’ve been a little bit behind. Just had 6 surgeries on my foot this month. I’m working on healing and answering comments. Looks like it’s going to be wonderful, Yvonne! LOVE those chairs… Perfection! These look gorgeous! Am so happy as I’ve been inspired by you to revamp our living room in the neutrals – we got new couches and they came w/several pillows – had to pick a fabric and went w/a navy/cream design ! Feeling even better about my choice now! Cant wait to see what is next! Navy or Cobalt have always been my signature colors since I was married in 1970- when avacado green and gold were the rage. I am happy to find much more variety available in the deep blues now. Navy or Cobalt have always been my signature colors since I was married in 1970- when avacado green and gold were the rage. I have struggled to find beautiful fabrics and rugs over the years to continue my blue themes. I am happy there is so much available now-I hope stays. This looks great!! It matches your style. The fabric is so gorgeous. I’ve waited so long for a darker blue to make a comeback in the decor world so I’m happy!! I started adding some blues a few years ago but my seating has worn out. A new look is coming my way as well. Refreshing is what I think your room will look. I think of the Sky. It has gray. Dark blue. Light blue. And pinks and yellows and almost reds. All of those colors don’t seem out of place as we look up. They match the neutral fields of corn as well as the dark turned soil in just plowed fields that are also found in neutral looks!! Nature varies the color pallet so I think we are allowed as well. Looking forward to your reveal!! I’m not normally a fan of paisley but those blue and white chairs are really bee-utiful! Blue has always been one of my favorite colors, if not my most favorite. 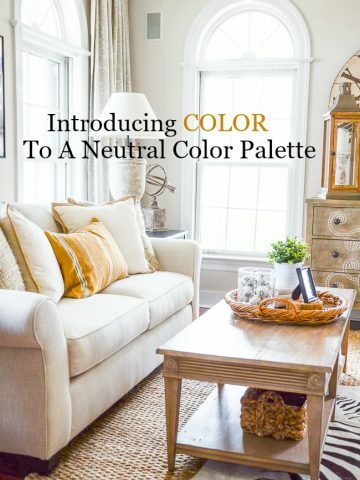 I think you will really enjoy adding that color to your neutrals. I’ll be interested to see what is next. I couldn’t love the new BLUE anymore if I tried! Absolutely stunning. I love the pattern as well. Can’t wait to see it all put together. Love , Love, Love the chairs! !Cant wait to see the full reveal. Oh my goodness, I love the chairs! 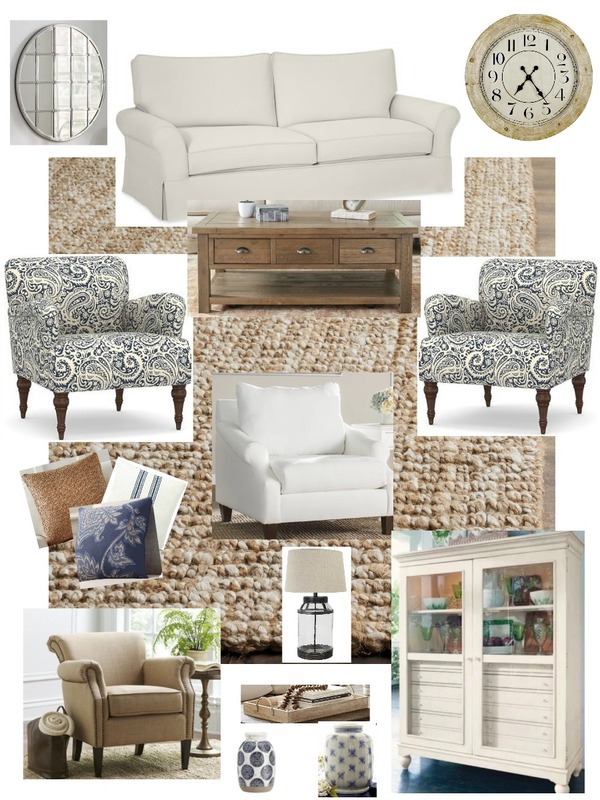 I am trying to transition my living room into neutrals…once I do, I must have a pop of blue! Might not be chairs but pillows, accents etc. LOVE! Yvonne, your blue paisley chairs are beautiful! Enjoy! I sure wish we had a Pottery Barn up where I live! I love their stuff! When we winter in the U.S. I always find lots of things that want to come home with me! I haven’t commented for some time but just had to stop and say that not only do I love those classic blue chairs but I’m loving the pared-back look of your family room. It looks really smart!! While I liked the baskets, metal country-style stars, numbered tags on baskets, etc, I felt the room was too much like everyone else’s decor. I like this new change – it’s bringing a real fresh feel to your home, Yvonne, and making it even more “you” than before! I also liked your shelves in the kitchen eating area but think it now looks much fresher, as well, with their removal. I once took a decorating class in my late 20’s and still remember the expert saying: “a little bit of blue in everything you do”. He also said there should be a touch or two of black in a room “for drama”. You were mentioning you need a table for the new blue chairs, have you thought of a ceramic blue/white Oriental style “garden stool” for the room? They are such a classic look and look beautiful with nothing on them … just letting the design take center stage. I bought one 40 years ago for my living room and recently bought another for beside my bathtub. I find they look beautiful anywhere you use them. If one is unsure as to what colors to use in a home, some decorators say to look in the closet and a person will see a tendency towards greens, tans, etc. but I found it didn’t work for me. I like browns, tans, oranges, etc. but decorate in sand tones and blues. I’ve been surrounded by blue for fifty years now and never tire of it! 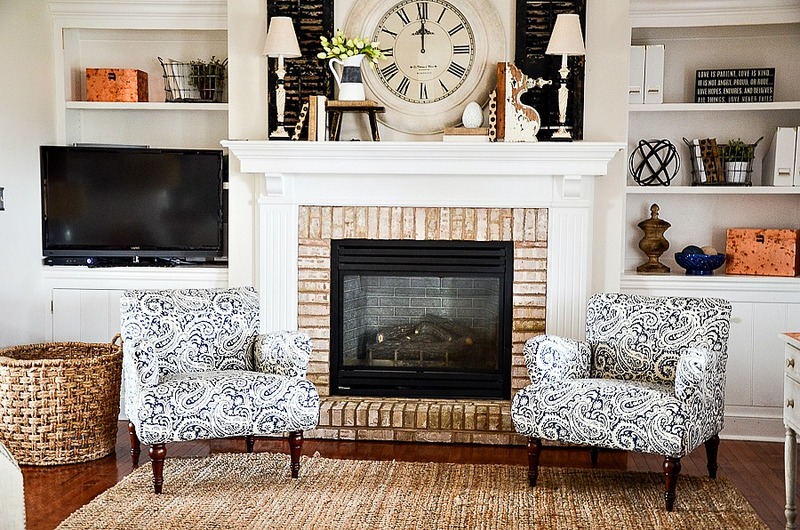 I am also going through a bit of a change in our family room – we purchased a new area rug from Pottery Barn with a soft blue background with various other colors of flowers – mostly cream and other softer colors. We just ordered two new leather club chairs in a more streamlined style. Our previous chairs had the larger rolled arms that were popular at Pottery Barn 12 years ago. Just a bit of info regarding Pottery Barn – their leather chairs are made outside the U.S. with inferior leathers that are bonded onto a leather base – also their delivery charge is outrageous. We have learned a great deal about leathers when doing our shopping. We finally went to a local store that specializes in high quality American made furniture. These chairs are a splurge but they are so beautiful and comfortable. I have purchased new throw pillows mostly in cream and blues and I plan on adding some seasonal accent pillows. I have never decorated with blues before, and I am excited about the fresh change. 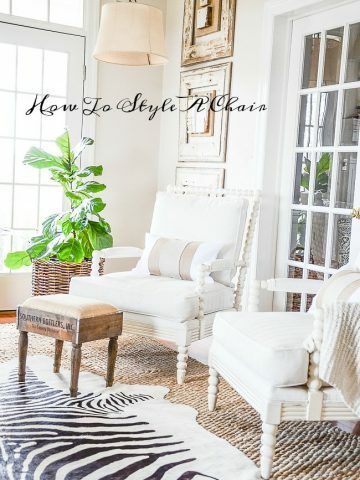 I learned all about styling with pillows from Stone Gable – Thanks! Would you mind sharing what brand of leather chairs? I have been looking for a leather chair and ottoman and have read bad reviews on pottery barn. Thank you. Ooooh, I love those chairs! Wish I had a Pottery Barn. I’ll throw my hat in with the dozens of people who have said that they love the blue and white/neutral look. My living room is navy and white, and these chairs would look pretty great in there. Can’t wait to see what other touches of blue you bring in! This is so ironic, I just started adding touches of navy blue in my family room. Trying to find the “perfect” accessories is driving me crazy. I know what I want, but I cannot find it in stores. Good luck with your “refreshing”! Love your new chairs. I love paisley and buffalo check. You have a tan colored buffalo check bedspread that I’m in love with. And guess what, they are sold out everywhere except twin size which I don’t need. That’s what I get for waiting. Somehow I just knew that you couldn’t stay away from blue and white for long. It’s too gloriously classic and beautiful! Good for you. I love them! You are so lucky to have a Pottery Barn outlet within walking distance, although you had better take a car for all your purchases. ? I like the direction your decorating is taking. I’ll be following closely for the many changes – big & small. I’m ready for a change myself but not a total makeover. Too expensive! 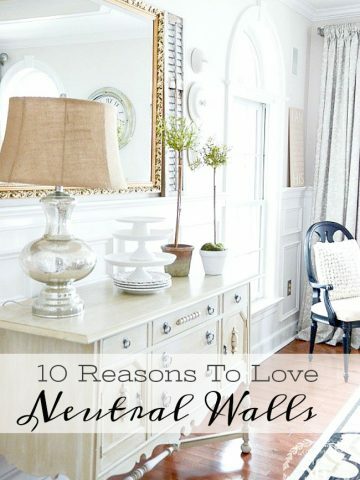 Love the addition of blue and seems to go beautifully with all of your neutral decor. Great decision to incorporate a bit more color! I so wish I had a Pottery Barn outlet near me!!! Saw some blue and white buffalo check pillows on the cover of deco mag and they said they were from pottery barn but couldn’t find them on line!!! Was disappointed!!!! 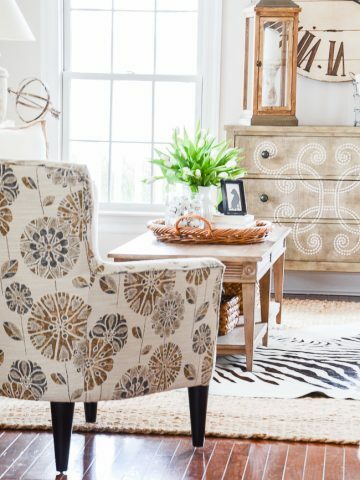 Love the paisley chairs, nice addition.The Paula Dean cabinet is a great pick,I have one of her cabinets in my dining room along with her table and chairs which I love.Can’t wait to see the finished room. Yvonne, love the blue additions to the family room! I have always been a “Blue” girl. I have a small collection of blue sponge ware, and it makes my heart sing! This summer I painted a cranberry red shelf a pretty light country blue, and put my pitcher collection there. This makes me happy, too! I am looking forward to reading more on your blog about the changes in the family room. I’m sure I will love them all! Still looking forward to reading your future book. Can’t wait until it comes out! Any news on it? Your blue? I’m Green! LOVE it !!! And PB can be dangerous.. I could actually walk to mine if I wanted…..
Green for me too! If I can have green, cream and paisley together I’ll be a very happy person. I love the chairs and the fresh blue additions! My closest PBO is an hour and 15 minutes away, a much safer distance. Most of my favorite things have come from there. I love your new chairs!!! I’ve always loved blue and I can’t wait to see what you do in your living room! I like the new look. Blue seems to be the color to add to decor right now. just love blue I have it in at least two rooms in my house….wonderful color! Just love the new look, and the blue bowl above the one chair really ties everything together. I had considered some blue colors a neutral color since that is the color of the sky and goes with everything. I’m SO glad you’re finally adding some color! Overkill of the neutrals. I use the glorious colors God has given us. Love the blue addition. This spring, I’ve added some blue pieces on the great room shelves. It’s amazing how just a little color addition really freshen up a space. Can’t wait to see what other pieces you add! Love the addition of blue! 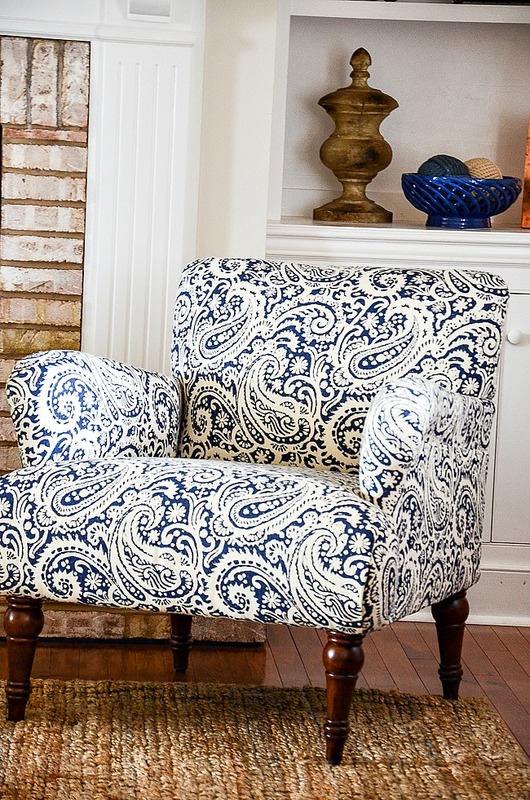 The paisley upholstered chairs are beautiful and your design board is inspirational. We have the Paula Deen Bag Lady’s Cabinet and love it! This makes me want to make the drive up to Leesburg, Va where there once was a Pottery Barn Outlet, I will have to investigate today! Love the chairs!! Even though I am not a blue palette person, I love to see blue and love the “feel”! Can’t wait to see how you pull it all together! Thank you! I love your design board! This is what is so great about your classic design. You can change a few things in a room and freshen the whole look. A touch of blue is perfect Yvonne! Thank you for the inspiration! Perfect addition to your family room. I, too, have been adding touches of blue, since finding a rug with blues on cream at Home Goods. Brought out the blue and cream pillows for the ivory couch and have found 2 small chinoiserie lamps for the dining area at local antique stores. I am so excited to tag along and be inspired by your decor choices. I am SO excited!!! I love color and I LOVE and collect blue and white accessories. I will anxiously await the total reveal of the changes in your family room. It looks like you are on the road to a smashing success!!! Great choices on the mood board, too! Now you know I LOVE those chairs! They look perfect where you have them. I have always LOVED blue and white, as you know. I wondered if you would ever grab ahold of the blues for your home too! I also love the changes to the shelves! and lots of Chinese blue pottery pieces as well as a blue velvet wing chair and our new bathroom grey, blue and white. I find it is always a great mix with neutrals. Love your blue pottery bowl on your shelves which picks up the blue of your chairs. Perfect. I love your choices, Yvonne. Blue is such a wonderful choice to welcome Spring back to Stonegable. I look forward to seeing it all! I live vicariously through you, as I sit here with a broken leg and a home that needs some major decorative love. You are soooo lucky to have a PB Outlet so close to home!! I adore paisley, especially when it’s in my fav color blue. Love the new chairs and addition of color to your back room. 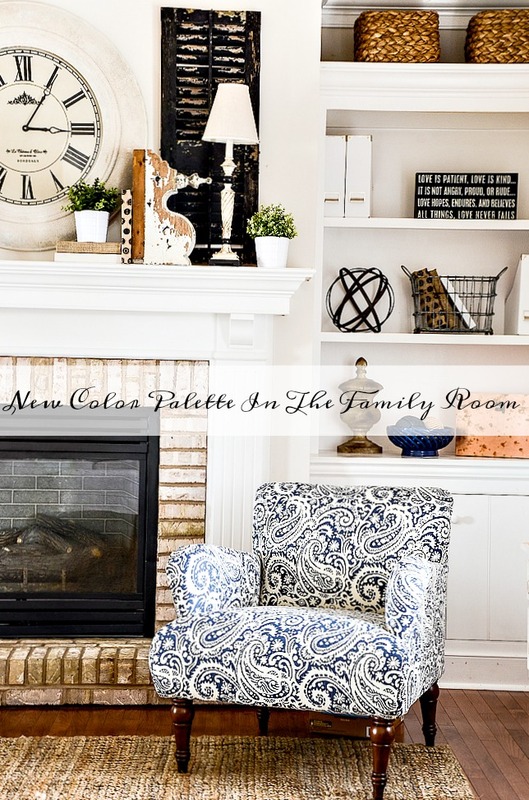 I also have blue paisley large throw pillows on our rattan armchairs around a small dining/game table and a blue/white ikat pattern oversized ottoman in our family room. Enjoy the cool calming pop of blue update! I have always liked blue. I cannot introduce it to my family room because of my current furnishings. However, I recently realized that I can get my “blue fix” by swapping out my throws and pillows in my study and guest room. It’s still a work in progress, but I love it so far! I’ve always liked your neutrals at Stonegable, but I’m so happy that you decided to add a pop of color. 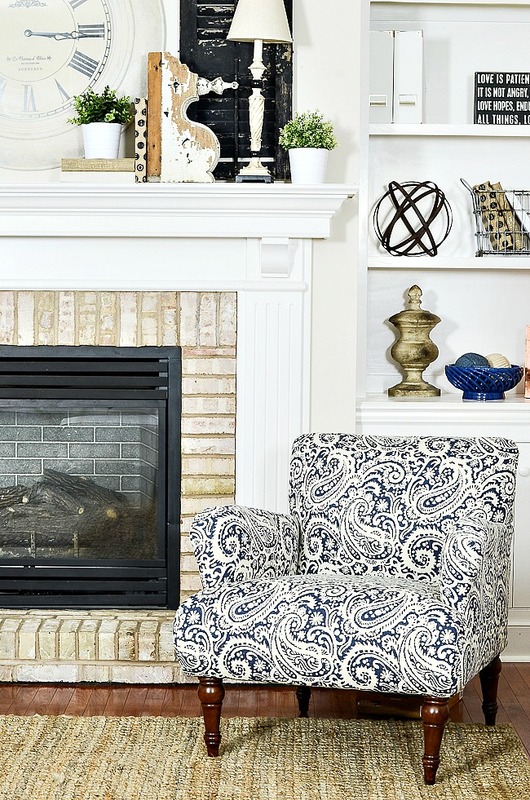 Blue is perfect for your family room. Hope you carry that color throughout your beautiful home! I love the new blue and white paisley chairs too! Perfect!!! I am a lover of blue! Your choices look great! I’m loving the blue. I am trying to change over my family room back to blues. I’ll be interested to see what you do in yours. Always love the great ideas. Just beautiful! I LOVE those chairs!! I am so excited you have chosen to add blue a that is exactly what I have decided to add to my neutral colors as well but wasn’t sure how to do it. I just keep being drawn to this color. So excited to have you lead the way!! Gorgeous chairs….can’t wait to join you on the blue journey.